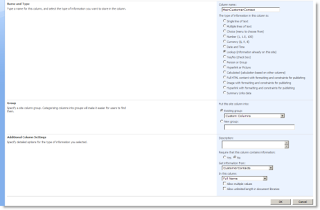 During my time with SharePoint I have encountered a number of requests where users want to be able to reuse data between sites. Using the DataView or Content Query Web Part (CQWP) is pretty easy since it supports connecting to lists on other sites, but it does not help for situations where the requirement is to include a linked field within a list. Linked fields can only be configured to link to lists within the same site. You can get around this limitation by using a Site Column to establish the link. The important thing to keep in mind is that the Site Column needs to be established at the same level as the column you want to link to. This means that the approach will only help with sites that are below the site that the Site Column is defined at. For this example I have defined a contact list called CustomerContacts which is at the root of the site collection. 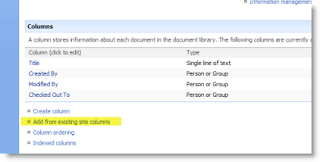 Then define a Site Column called MainCustomerContact that links to the Full Name field in the CustomerContacts list. The next step is to add the new Site Column to a list on a sub-site. After it has been setup you will now have the dropdown list when you go to add or edit a record in the list. Fields with a value from the other site will display as a link, just like normal linked fields. Clicking the link will lead you to the list’s item view with all of the details for that item record. Using this method will help you reuse the data already being maintained in the system without having to duplicate the list or list data.